Most people are not happy. They recognize in their quiet hours that they are longing for something more in their life. They think that maybe something different from what they are experiencing now is the answer to their longing. This feeling drives people to act in a multitude of ways. Maybe if we exercise and lose weight, we will feel better about ourselves? Maybe if we dressed differently or look better that will change the way we feel? Maybe if we had more money or used what we have more wisely we will feel fulfilled? Maybe if we changed jobs or moved or did something to shake up our lives, our feelings would change to something better? Maybe if we back the right politician or political party, they will bring about the change we want and finally we will be happy? Maybe if we protest and let our voice be heard that will bring about a change for the better? Maybe if we join up with our neighbors, school and community we can make a change that will make a real and lasting impact? And yet with all of this talk of change I find very few people who are really happy even after the changes are made. People are still hungry for more change. People are empty and confused because they made the change and are still unhappy. What if the change we are looking for is more spiritual that we want to believe? What if there is a longing in the human soul for something better that only God can fill? What if true satisfaction can only be found in Christ and his community? I believe true, meaningful change only happens when we surrender all of our lives to Christ. We experience something new and different when we live for him. It’s hard to explain until you have experienced it for yourself, but I would ask you to consider the possibility that your life will never be fulfilling, no matter what you change, until you come to Jesus. Then we can lock arms with other people who have come to Jesus and make a real difference in the world. Lives will be changed in powerful ways that bring satisfaction and together we can make our world a better place. I know many of you don’t believe me, and in one month on January first you will be thinking about the new year and all the changes you need to make next year. You will believe next year will be better. It is the same thing you have thought every year for as long as you can remember. What if this time you made a different type of change? Recently I was part of a decision that impacted several people who I do not know personally. I knew that making this decision would create large amounts of feedback and criticism from a few people. During this process, I have heard numerous stories and had several questions asked that I found both humorous and sad. This has led me to the conclusion that the real truth is hard to find. 1. The truth is not one person’s experience. Every story needs a corroborating witness. The Bible made people establish everything on two or three witnesses. There is a wisdom in this type of thinking. Each of us tends to remember events selectively. Therefore, one person telling a story of what happened is not always the real truth. 2. The truth is not my feelings about what happened. Each one of us has the tendency to interject our own feelings into a story. What we saw made us mad so we tell a story with anger and interject evil intent. Our experience is deeply connected to our emotions and sometimes it is hard to separate the two. Again, this is why multiple witnesses are important. Quite often it is important to hear both sides of the story. 3. My opinions on the story are not facts. One thing I heard recently was, “This is what happened and if you ask me, this is what was really going on.” When I heard this statement made and listened to their opinion I realized they could not be further from the truth. Our opinions are shaped very much by our experience and therefore most of my thoughts are clouded. I am not saying your opinions are always wrong, I am saying they do not always align with the facts. 4. Finding the real truth takes time and hard work. If I want to know the whole story I need to talk to multiple people who were involved. I need to read information on my own. I need to listen closely for interjected feelings and opinions. I need to ask if the person telling the story has a bias. There are several steps that need to be taken to understand the truth of what happened. The real truth is very hard to discern. Unfortunately, we live in a world of one line twitter feeds, emotional Facebook posts and biased internet stories. Texts are sent with partial truth. Emails are shared that only tell one side of a story. Conversations are accepted as total truth without question. None of these are wise ways to handle information. As believers, we need to be extremely cautious about the stories we tell. We may think we are doing a service when in fact we are doing harm. The hard reality is that the real truth may be far from our lips. So when you hear that juicy negative story that makes you feel something deeply and you want to run out and share it with the world – please, for the sake of Jesus, keep your mouth shut. We live in the world of the multitask. Everyone is trying to do numerous things all at once. We drive and talk on the phone. We text and eat. We try to read with the TV playing the biggest game of the week. The problem is that when we try to multitask we only give each task only a partial effort. Sure, you may be able to talk and cook, but one of those is suffering. Sure, you may be able to look at Facebook while listening to a sermon, but one is receiving your primary attention. Sure, you might be able to do two things at once, but one of them (or possibly both) are not getting the needed energy to do it well. Some of these distractions simply are not a big deal. So what if the meal cooks a little long? Who cares if I miss a few plays on the game? No one will know if I forget a few pages. Some issues are not a big if I am only giving a partial effort. Relationships, on the other hand, always suffer when we live distracted lives. Your spouse needs you to focus on them for a while each day. Your children need you to listen closely to what they are saying. Your friends want you to give them your best. Relationships do not thrive when we are only giving them partial effort. Maybe the opposite of not loving God is not actually hating God; maybe the opposite is being divided. Having our thoughts split between multiple desires and actions at the same time. Spending our lives being pulled in numerous directions. As we enter the holiday season it is easy for us to attempt to do a hundred different things and many of them all at once. The truth is that what we may really need is to slow down and give all of our relationships the energy they deserve. That includes spending time focused on God. Perhaps the best gift in the world we can give this holiday season is our full attention. 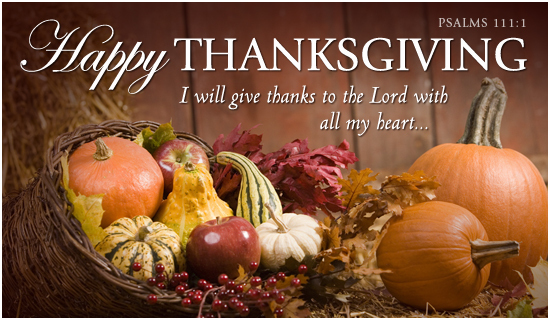 I want to wish everyone and happy and wonderful Thanksgiving. I sing the lyrics occasionally as a joke when I have done something right. I laugh. My kids roll their eyes. Life moves on because we know I am only joking. The problem is that we live in a world of self-promotion. My Facebook feed is full of people telling me of all their accomplishments. If they are not bragging about their lives then they are shamelessly promoting their children victories. It is easy to fall into the trap of pride. I know because I feel the draw towards it in my own soul. I want to brag about my accomplishments. I want people to praise my parenting. I want my name to be known above other people. The Bible is very clear that pride is a sin. God opposes the proud (James 4:6) and pride comes before destruction (Proverbs 16:18). There is a simple reason for us being humble according to the Bible. It is because we are not the product of our own efforts. God gives us the blessings of our life. It is God who gave us our talents and abilities. It is God who opened and closed doors throughout our lives. It is God who gave us healthy children that can accomplish the tasks set before them. You are right. They are wrong. They were at fault and you were innocent. They said and did the that without thinking of your feelings. You have every reason to be angry. You can fill yourself up with hatred and evil emotions and you will be completely justified. 1. Anger will not change what happened. 2. Anger will not fix your problem. In fact, it may just create more problems. Anger causes us to say some extreme things we really don’t mean. 3. Anger will not heal your relationship. Anger is never the pathway to healing. Sometimes it makes the other person feel bad, but that is usually the best we can hope for. Genuine apologies rarely stem from arguments. 4. Anger will slowly destroy you. Anger will tear you up inside. It will fill you with bitterness. It will put a sword in your mouth and your words will pierce and cut the recipients. Just because you have a reason to be angry does not mean you should get angry. In fact, very few times in life is anger a productive response. Stay wise and under control, it will be much better in the long run for everyone. As I mentioned yesterday, at youth group on Wednesday night I taught the teens about prayer using the PRAY format. Then we had the teens break into groups and go pray at four separate stations. At the area for repentance, the teens were given 3×5 cards on which they could write a sin. They were confessing something they were struggling with and then were to talk to God about it. When the time was finished the teens asked what they were to do with their cards. Apparently one suggested they just tear them up and the youth leader said, “We do have a paper shredder.” The group thought it was a great idea. They took their failure and shredded them into tiny little bits of paper that can never be put back together. After listening to this story I had the immediate opposite thought; “Most people I know keep their cards in a filing cabinet instead of using the shredder.” We like to take those old sins, failures, and mistakes and hold onto them. Then when we are feeling sad we can go back to the file and remind ourselves of all of our shortcomings. Possibly we are feeling happy and one look in the cabinet can bring us back down again. Many people hang onto the past and file it away nicely and then one day they can recall every detail of their sins. Honestly, I have never found that holding onto past failures was helpful for today. So the next time you confess your sins to God, take that experience over to the paper shredder and not the filing cabinet.